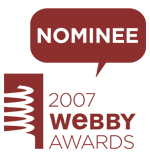 "Webby Honorees, Nominees and Winners truly represent the best of the Web. They are but a small percentage of total entries and have been chosen by members of the International Academy of Digital Arts and Sciences based on a number of creative and functional criteria." Webby Awards. El website de DRGFF fue nominado en la categoría "Online Film & Video" en la sub catergoría "Eventos y Transmisión en Vivo". http://www.lat34.com SA Stewart Communications, Inc.